My adult son, Ash, who has practiced bushcraft since he was old enough to walk, worked with me on this field review, which was done in the Oregon Cascade Range and in Bulgaria’s Stara Planina Mountains. Here is how we addressed these needs with the review knives—no axes or chainsaws—as our only tools. Security was a minor concern in Oregon’s Cascades. However, due to packs of feral dogs and European jackals, security was a major concern in Bulgaria, and not only in the mountains. In recent years there have been at least three reported deaths of travelers killed by feral dog packs. Thousands of residents seek medical treatment for such attacks each year. I have been attacked by feral packs three times during visits to Bulgaria. Our first task was to make defensive spears, which is a heck of a lot better than facing a hungry pack with a knife as your only weapon. Trust me on this. Note: Do not attach your knife, your most important tool, to the end of a stick. A spear as shown in the images accompanying the story will serve and takes less than 10 minutes to make. To make a fire the author and team constructed a platform to get the tinder and kindling off the wet ground, and also walls to dry firewood and protect the setup from driving rain. Fire was needed in both locations. It rained almost nonstop in the Cascades. When it wasn’t raining it was snowing. All downed wood was saturated and standing wood was green. To make fire we constructed a platform to get the tinder and kindling off the wet ground, and also walls to dry firewood and to protect the fire from driving rain. It was cold, in the mid-30s, in the Stara Planina, but dry. Making fire was not a challenge. We were not concerned about shelter because in both locations we carried emergency reflective blankets and nylon cord, from which we have many times, even in winter storms, made adequate shelter. Clear running streams were nearby in both locations, so water was easily obtainable. The author and his team made a stick and two spears for hunting small game, fishing and self-defense—the latter to fend off feral dog packs that roam parts of Bulgaria. From top: rabbit stick, fish spear and defensive spear. The knife is the Fallkniven S1 Pro Forest. We noted game tracks and other sign in both locations, and fish in the streams. Hunting with the indigenous people of Latin America and Southeast Asia I learned that a rabbit stick, nicely carved or not, can take small game up to about 20 yards—if you have the other skills required. A rabbit stick is simply a chunk of wood thrown so that it spins, creating a projectile that’s in effect 2-to-3-feet wide. One about 3 feet long, hefty and slightly curved took about 10 minutes to make. When thrown it spins and strikes small animals with enough force to knock them cold. A fish spear required another 15 minutes to make. These tools are not pretty. However, they will work. To find the materials required and make fire under the conditions described, make a shelter, a defensive spear and primitive hunting tools took little more than an hour. The less work required for a task the fewer calories burned, something all bushcrafters should keep in mind. Dressing game and cutting meat can be hungry work, and are bushcraft uses of a knife. Unfortunately, we could not legally take game in these areas with primitive weapons. Assuming a successful hunt, which we have previously experienced, we cut up a grocery store duck. Considering that we could be stuck in the wilderness with only one of the knives, we used each one for every task. Cutting saplings can be heavy work. The trick with a small knife is to bend the sapling and to cut on the outside of the curve. Carving fish spear points is fine work, defensive spear points less so. Making a rabbit stick can be hard work, depending on the wood chosen and how fine a job you want to do. You do not want soft wood for a rabbit stick. The wood we selected was hard, knotty elm that required a good bit of force to get through the knots. Much of the firewood in Oregon had to be split to get to the green but dry wood inside. Only the Ontario Bushcraft Woodsman was used to chop, because it is designed to do just that. The other knives were batonned to get through knots and tough spots. Batonning creates much less impact to the edge than chopping and less possible damage to a blade not designed for the purpose. The little blade of the Woods Wise from Condor Tool & Knife performed like a dream sharpening the point of a defensive spear. The author indicated the Woods Wise has a comfortable handle, a good blade and is a handy package. With a short, razor-sharp, finely ground carbon steel blade and handsome walnut handle, the Woods Wise from Condor Tool & Knife is a peach of a little knife. The key word is little. Taking down a 2-inch-thick sapling required 17 minutes. However, it did do the job, and the little blade performed like a dream sharpening the tines of a fish spear and the point of a defensive spear. It required a bit of force to get through tough knots on a rabbit stick, but the slim blade was up to the task. It has a comfortable handle, a good blade and is a handy package. Tucked away under your shirt it could be the only blade you have when night falls and you’re far from home. According to the author, the S1 Pro Forest sliced duck through skin, meat and bone like Luke Skywalker’s lightsaber. Fallkniven’s S1 Pro Forest Knife is the evolutionary descendant of the company’s S1, which has been in production for over 20 years. The Pro version is made with better steel than the original S1, is more sophisticated and a better performer. The S1 Pro simply does everything well and with no fuss. Its convex grind does not bind in deep cuts, goes through tough, knotty wood with little effort, peels bark, makes feather sticks, does fine work as on fish spear points with full control, and slices duck through skin, meat and bone like Luke Skywalker’s lightsaber. It cut through 2-inch-thick saplings in about a minute with little effort. The non-slip grip is comfortable and does not, in fact, slip. The geometry of the Bushcraft Woodsman’s blade, combined with the overall design, good steel and heat treat, make for an exceptional big knife. 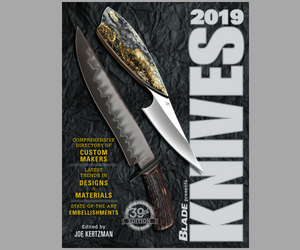 Veteran bladesmith Dan Maragni designed this issue’s cover knife, the Ontario Bushcraft Woodsman. The big blade shows his expertise and lineage as an accomplished smith, and is far more sophisticated than a first glance might suggest. The distal taper gives it excellent balance, and, combined with the taper from spine to edge, great chopping ability. We slashed through 2-inch-thick saplings with a single swipe, an important point in the calories-expended-vs.-results-achieved equation, and when night is falling and you need to get a fire going. Not as handy for fine work as the smaller knives, Dan’s design is a reassuring blade to have by your side in deep woods when the jackals are howling—or the Orcs. The Larry Roberts Signature Edition Gen6 Scandi from L.T. Wright Handcrafted Knife Co. bites into the wood in use as a drawknife. Due to its scandi grind, which tends to hang up in deep cuts, an average of three minutes was required to get through 2-inch-thick saplings with the Gen6 Scandi. The Larry Roberts Signature Edition Gen6 Scandi from L.T. Wright Handcrafted Knife Co. performs like a “Mora on steroids,” according to Ash. I agree. If you’re familiar with the scandi grind, the only surprise with the LRSEG6S is that it takes scandi-ground blades to a higher level of performance. It excels at controlled shallow cuts, holds an edge well, and is strong enough that when batonning you can twist the blade with no worries and quickly pop the batonned material apart. I like the longer 6-inch blade much better than the popular 4-inch pattern because you can get more stuff done faster and at no penalty to doing fine work. Due to the scandi grind, which tends to hang up in deep cuts, an average of three minutes was required to get through 2-inch-thick saplings. Comfortable in the hand, it is also beautifully made and finished. A good all-around performer, it is a classic belt knife for the woods.